At the Spotted Mallard May 25th the group will feature Roger McLachlan on bass, Richard Tankard on keys and drummer Andy Sylvio. Geoff Achison returns to Stawell’s historic Diamond House restaurant and motor inn. Come for dinner, enjoy the show, stay overnight. Geoff Achison is back in Melbourne and performs at St Kilda’s exciting new concert venue, The Fyrefly, Friday Nov 30th with bass 'n' drums from Roger McLachlan & Sam Leskovec playing a selection of acoustic/electric tunes from old times and new! CD Release Party for Geoff Achison's brand new album ‘Sovereign Town’. Spend a weekend at Jorma Kaukonen's Fur Peace Ranch hanging out and jamming with Geoff and many other like-minded souls. Super-charge your soloing and become a better all-round player. You never know who might turn up and what might happen. Childhood Cancer Benefit Concert II from Jarrod Risson on Vimeo. 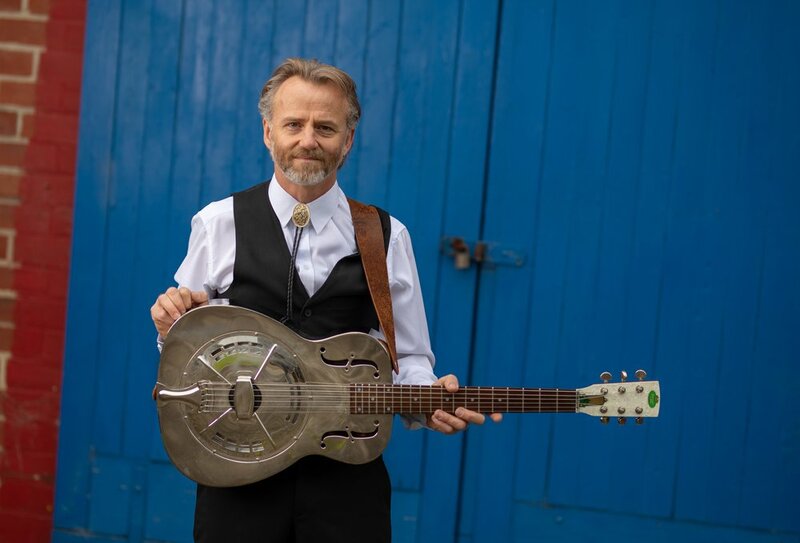 20 years since receiving his trademark blonde acoustic instrument from Gibson Guitars USA, Geoff brings his Solo Show to The Skylark Room in Upwey playing old faves and new, dynamic arrangements of blues & soul classics and a few tall stories from the road. 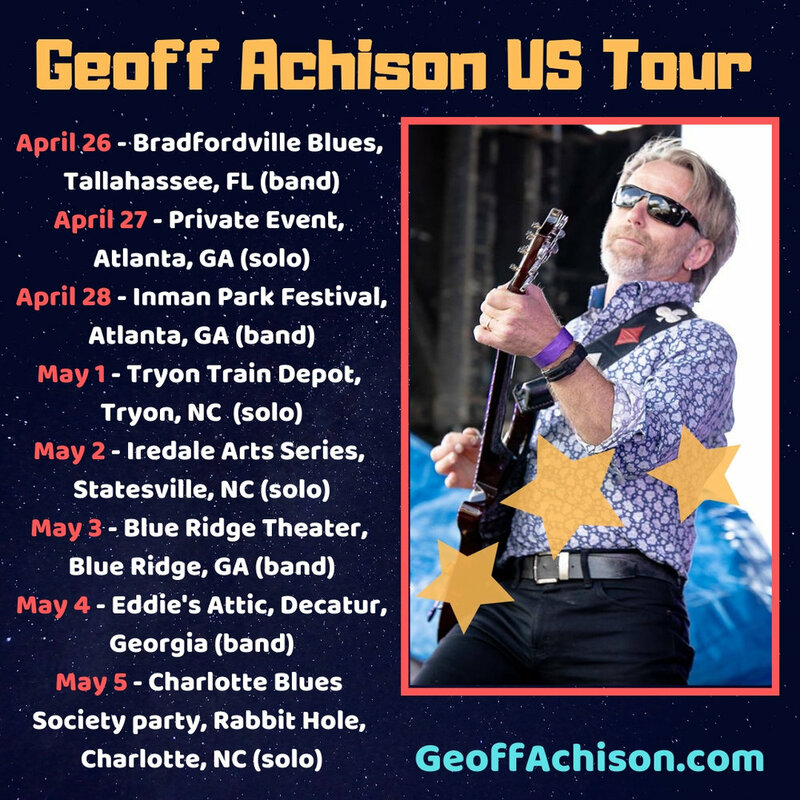 20 years since receiving his trademark blonde acoustic instrument from Gibson Guitars USA, Geoff brings his Solo Show to Sutton's House of Music playing old faves and new, dynamic arrangements of blues & soul classics and a few tall stories from his life on the road. Once the restaurant is full there will be standing room only. Bring your axe and jam with one of the best in the business. 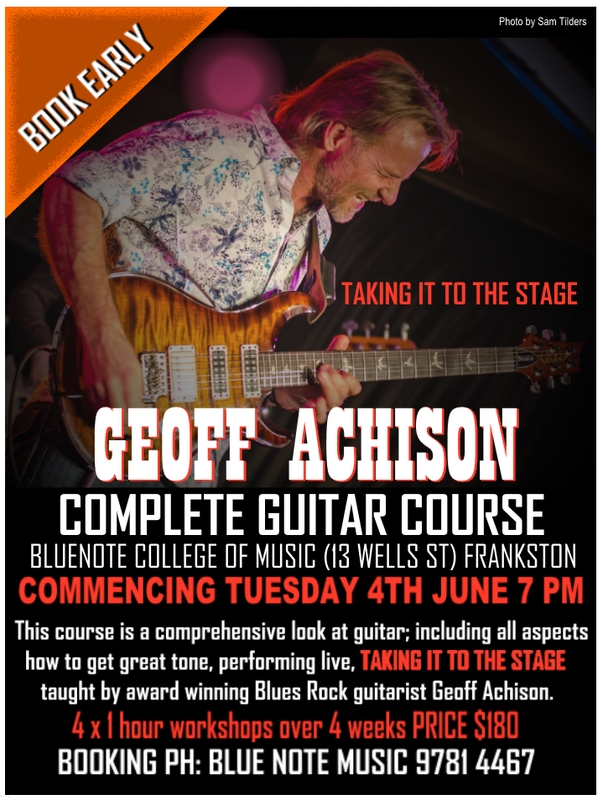 Combined instruction and conversation session covering the blues improvisation, rhythm & lead playing, extended scales, creative ideas, song-writing and musical approach. Geoff's album 'Another Mile Another Minute' has been picked up by US label, Landslide Records and will be made available world-wide from March 3rd. To celebrate and by way of a farewell gig Geoff will be performing a full acoustic/electric show at The Flying Saucer Club with The Souldiggers and special guest star Lloyd Spiegel plus horns from Paul Williamson. Tix $10 per adult and $5 per child. Summer Showcase featuring Mike Rudd, Geoff Achison, Lloyd Spiegel and Cass Eager. Westernport Hotel, San Remo Vic.